Regular Schedule – Every 2nd and 3rd Sat. 11:00-4:00 – Mid March through October. Group rental only on days & time train is not scheduled to run. Call Doris Newman at 903-569-6183 for more information or to schedule a group ride. Located to the immediate west of U.S. Highway 69 and between Front & Commerce streets is the old Union Depot which serves as an Amtrak passenger station and as a small railroad history museum. The station has a passenger waiting area, an office area, restroom facilities, a railroad artifact area and a conference room. The depot was remodeled in 2005 and rededicated in 2006 with its exterior having been restored to its original 1906 design. 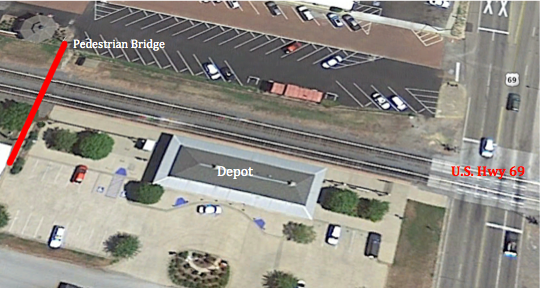 The multimodal depot is now known as the Mineola Transportation Plaza and won the “Best Building Restoration” award from the Texas Downtown Association in 2006; the city leases the property from the Union Pacific Railroad. Located approximately 50’ west of the depot is a 30x60 open commons area with cement flooring and seating around the perimeter. 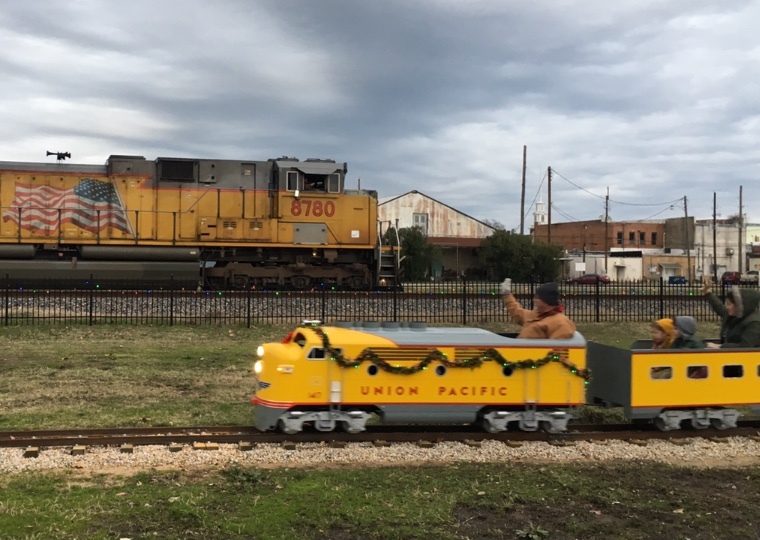 A 15 inch gauge replica of a Union Pacific train has been built by Swannee River Railroad Company in Lufkin, Texas and funded by the Meredith Foundation. The train is running from the depot waiting area, west to the tree-lined area and back to the ticket booth. (see photo in packet) The total distance is approximately one-quarter of a mile. 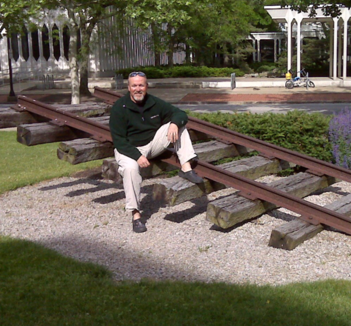 Tracks have been purchased and delivered and will be laid using volunteer labor of area railroad enthusiasts. 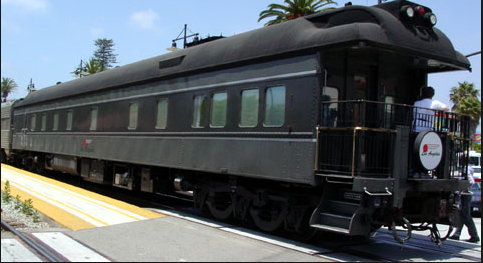 The engine is diesel and each passenger car will hold 12 patrons. On May 12, 2018 (National Train Day), a model railroad replicating 1930’s Mineola & her 3 railroads was opened in the Mineola Depot Museum. 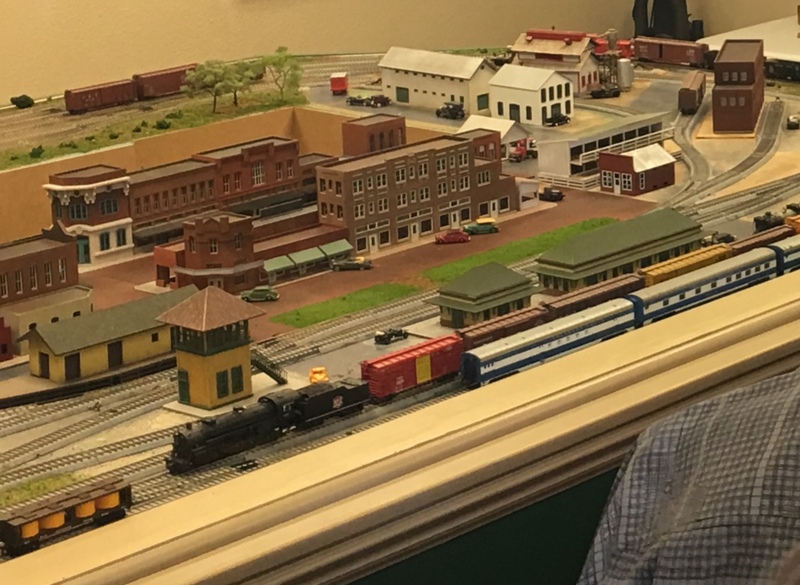 The model train layout will be used as an educational tool for individuals and groups who are seeking to learn about Mineola/East Texas and her railroad history. The trains will have the capability of being run remotely from inside and outside the train room. In the future, an individual operating the display will also have the option to hear historical information about selected Mineola businesses by pressing the button corresponding to that business. The train storage building is a replica of the Round House that was in the West Mineola train yard. It will serve as a feature for our train to pass through as well as the housing area for the train when not in use. Photo of the Round House in the West Mineola RR Yard ca. 1930. An additional 552’ has been added to the existing 4’ x 332’ pipe tubing fence. Name plaques are being sold for a $500 donation to Iron Horse Square to raise money to purchase the fence. See over 100 photos of trains and trainmen in Mineola and East Texas displayed on a television inside the museum. 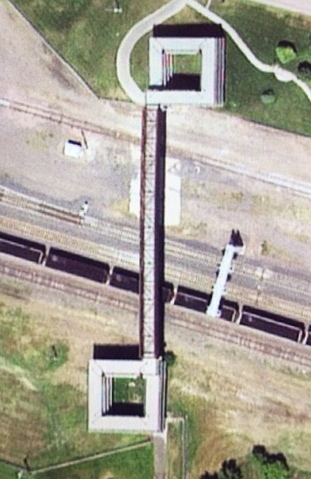 A foot bridge over the Union Pacific Railroad connecting Commerce Street parking with the Railroad Park will be added to allow foot traffic and bicycle traffic safe access to the depot and the railroad park. 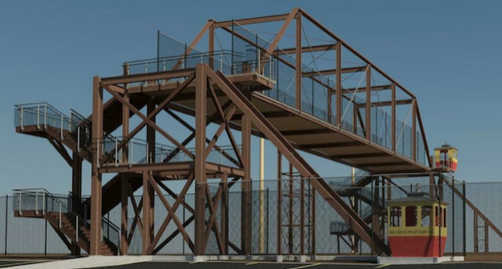 This foot bridge will also benefit Amtrak passengers waiting for their train. 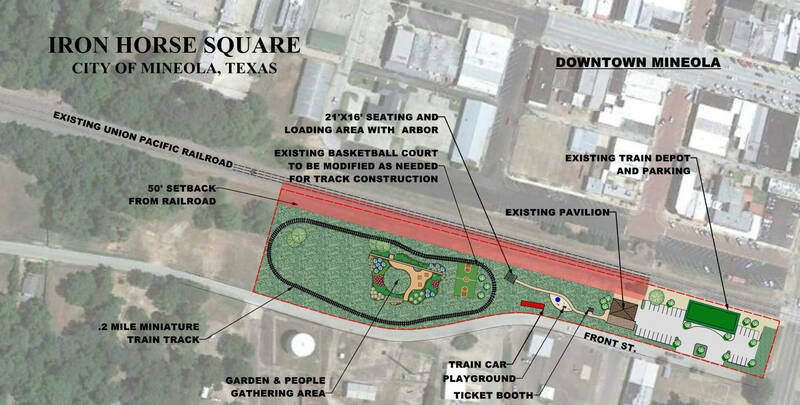 It will allow them to safely cross over the railroad tracks to dine and/or shop in Mineola and to return to the depot in time to board their train. Access to the bridge will be switch-back ramps leading to the main bridge. The foot bridge will be a truss design. The only means at present for foot traffic to cross from Union Depot and Iron Horse Square is to walk over the Hwy 69 crossing (a major U.S. highway with heavy traffic). 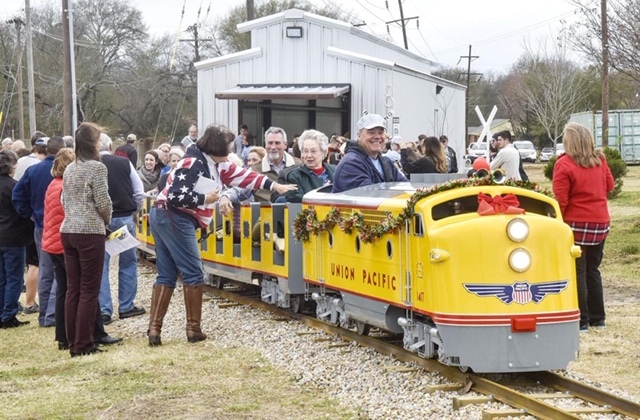 A replica of Mineola Interlocker #62, authorized by the Texas Railroad Commission in 1905 as one of the first interlockers constructed in the state of Texas, will be built by a local builder. Procurement of switch levers, switches, pipes and rollers to bring the inside of the tower to true historical replication will be a top priority. This will accommodate a Railroad Museum, Souvenirs and Concessions. 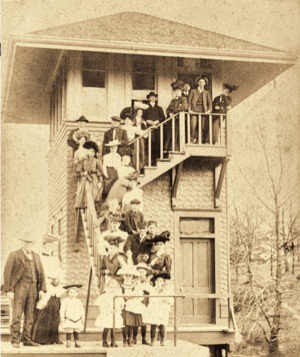 Historical signs will be posted alongside the entire walking path telling the story of Mineola’s railroad heritage. 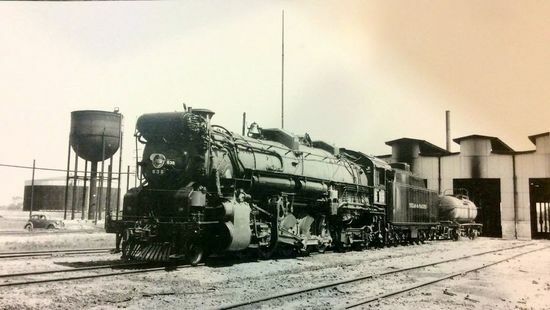 The story will include the International and Great Northern Railroad , the Missouri Kansas and Texas Railroad, and the Texas and Pacific, Missouri Pacific and Union Pacific Railroad companies. These signs will explain the history and impact of the railroad in Mineola & East Texas and how the Union Pacific Railroad Company is helping to ensure our railroading heritage will live on for many years to come. These will provide park goers areas to take pictures. Waiting area/Depot will be a covered, open air waiting area near the NE corner of the mini train tracks. 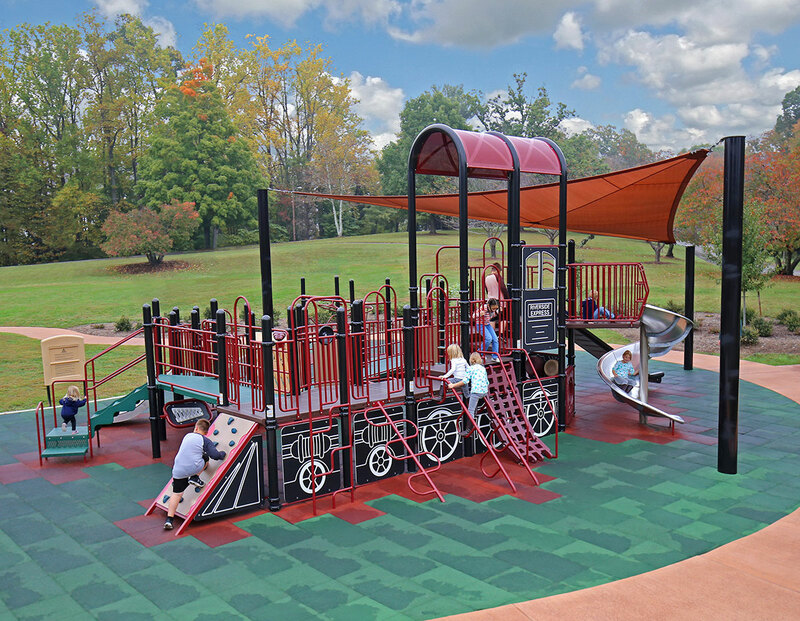 Playground will consist of train related play equipment. A swing set will also be included. call Doris Newman at 903-569-6183. 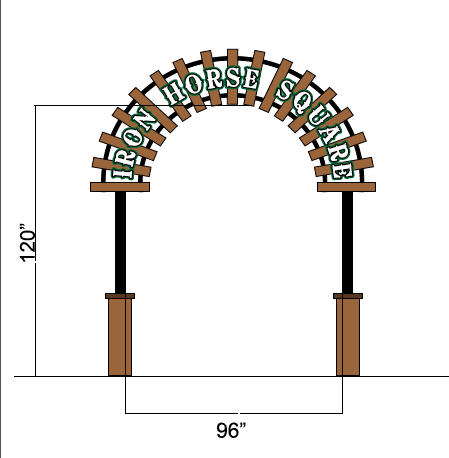 Follow the Iron Horse Square Project on Facebook. Iron Horse Square website donated by Vic and Cynthia Savelli. Copyright © 2019 Iron Horse Square. All Rights Reserved.